We wrote THE BOOK on Real Estate Law, and we continue to define it. THE BOOK is the most widely used and judicially recognized real estate treatise in California and is cited by practicing attorneys and courts throughout the state. We are not exaggerating when we say, “We wrote THE BOOK on California real estate law." 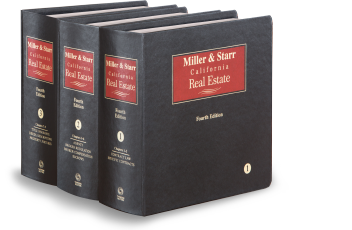 For over fifty years, our attorneys have been writing and updating the most authoritative and comprehensive treatise in the field, Miller & Starr, California Real Estate. Currently in its fourth edition, THE BOOK is the most widely used and cited California real estate law reference for lawyers, judges, and real estate professionals. THE BOOK has been cited hundreds of times in reported decisions at all levels of state and federal appellate courts in California. Now expanded to twelve volumes and forty-five chapters, THE BOOK covers virtually every subject related to real property and the business of real estate development and finance in California. The current edition provides in-depth coverage of basic real property issues such as deeds, escrows, title insurance, recording and priorities, deeds of trust and secured land transactions, as well as regulated areas such as the Subdivision Map Act, the Subdivided Lands Act, common interest developments, agency and brokerage law, redevelopment law, eminent domain, CEQA, and environmental law. It also covers real estate transactional and litigation subjects such as contract formation, enforcement and remedies, commercial leasing and residential landlord-tenant issues, easements, lender liability, usury, construction law and contracting, liability for defective construction, premises liability, mechanics liens, and many other real estate subjects. THE BOOK is continuously updated by Miller Starr Regalia attorneys as case law, statutory, and regulatory developments require. The firm’s attorneys also produce a monthly Newsalert periodical and annual supplements to keep THE BOOK up to date. In the process, we solidify our knowledge and leadership in the field of real estate law. We also have a full-time staff attorney who manages and maintains the updating process and alerts the firm’s other attorneys to significant judicial decisions and legislative actions that have an effect on our clients or our practice. Available only through Thomson Reuters Westlaw, Miller & Starr California Real Estate 4th presents a comprehensive analysis of statutory and case law and regulations affecting ownership, development, leasing, transfer, and financing of California real property. It also provides cross-references to facilitate related research and includes relevant commentary addressing legal and social trends. Miller & Starr California Real Estate 4th is available in print or eBook. Available only through Thomson Reuters’ Westlaw, Miller & Starr California Real Estate 4th presents a comprehensive analysis of statutory and case law and regulations affecting ownership, development, leasing, transfer, and financing of California real property. It also provides cross-references to facilitate related research and includes relevant commentary addressing legal and social trends.